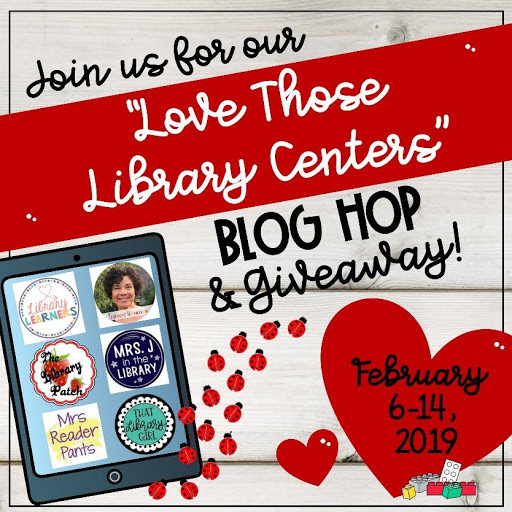 Over the next few days, we’ll tell you a little about each of the six teacher-librarians, their TpT stores, and a little about their librarian life! 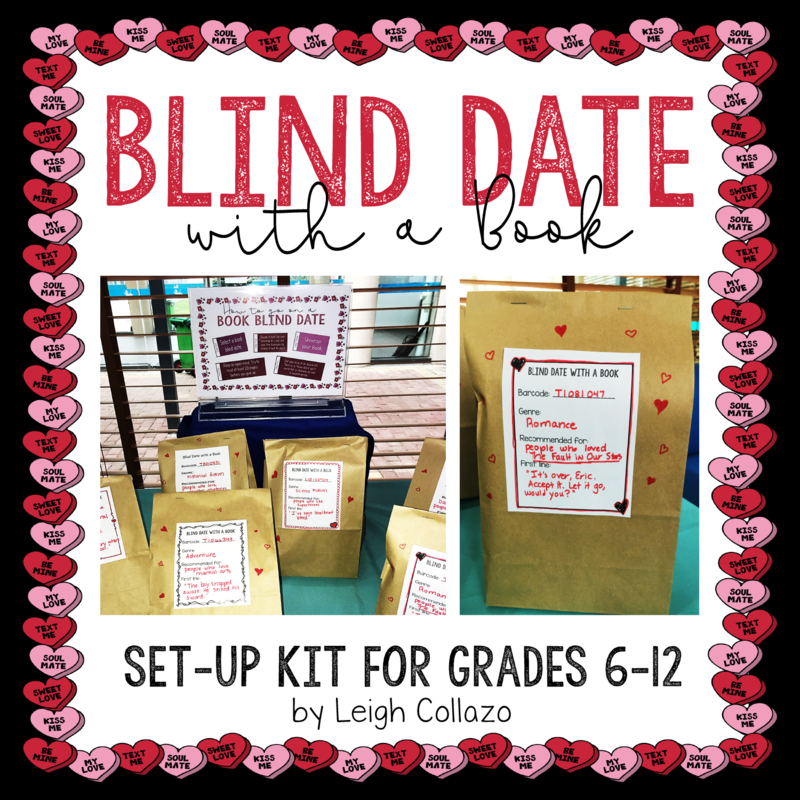 Today, I am sharing a kit to help encourage your students to try some new genres with "Blind Date with a Book." Today's idea won't be anything new for most of you. 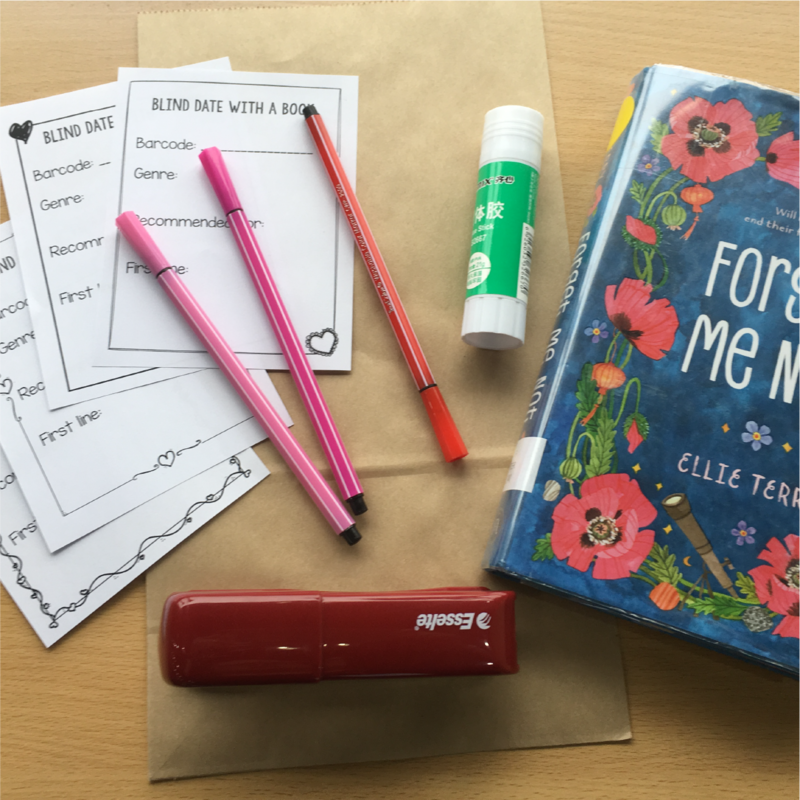 Blind Date with a Book has been around for quite a few years, and you can find loads of ideas for it all over Pinterest, FaceBook, and Instagram. I didn't invent this idea, and I'm not the first to do it in the library. 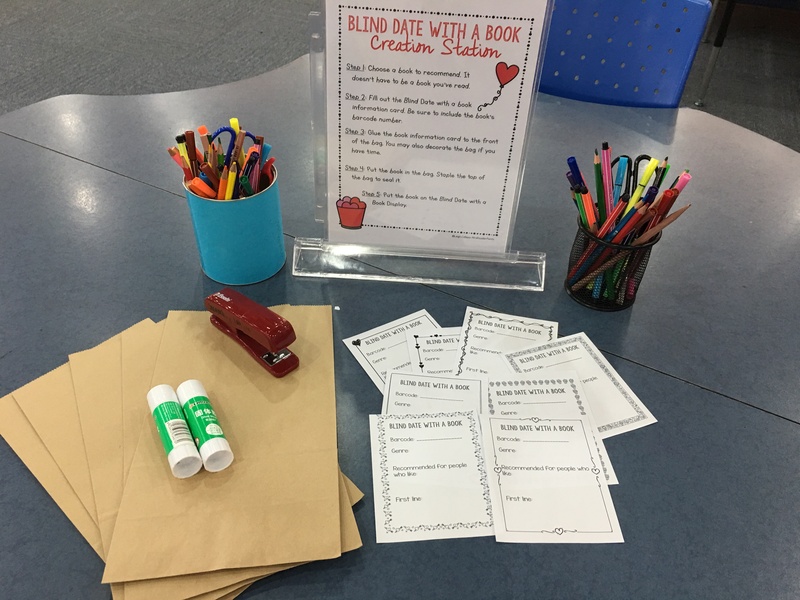 What's special this week is that I've made it as easy as I possibly can for new librarians and librarians on-the-fence about Blind Date with a Book to implement it in their schools. 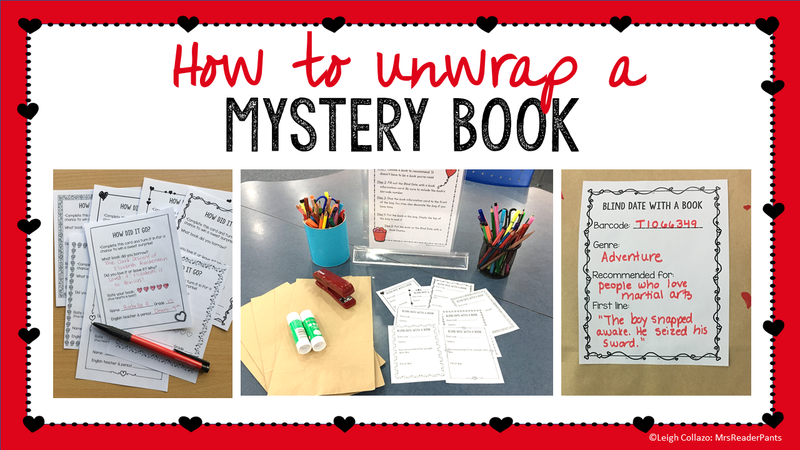 I've created a set-up kit, and I'm including step-by-step directions here for anyone who wants to start a Blind Date with a Book program. Elementary librarian? Don't worry, I have an elementary version of this, too! I call it "Unwrap a Mystery Book," but I've also seen it called "Don't Judge a Book By Its Cover." 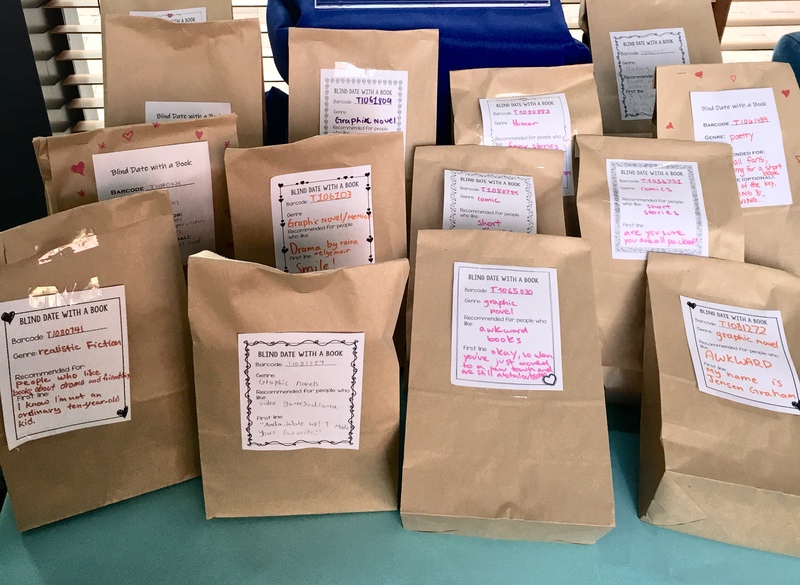 If you are using lunch sacks (as I recommend below), you could also go with a lunch or picnic theme and call it something like "Book Sack Lunches" or "Lunch with a Mystery Book." With a lunch theme, you aren't even limited to Valentine's Day! Whatever you call it, you can just substitute it for "Blind Date with a Book" in the post below. It will work the same way, and I have created all the materials you need in a separate product linked below. I started my Blind Date with a Book this week because we have Chinese New Year break from February 2-17. If you want to do it for Valentine's Day, you'll need to start in the next week or two. Don't worry! Set up is easy, and your students will love helping you! wrapping paper or paper lunch sacks--I did the lunch sacks this year and LOVE it! It's so much easier and faster to create the Blind Dates now! I wanted to get red, pink, and white sacks, but I could not find any large enough to hold YA books. Maybe you'll have better luck than I did--I don't know of any dollar stores or party stores in Shanghai. I do like that students can draw easily on the paper bags if they wish. art supplies--At a minimum, you will need pens, red and pink markers, glue sticks, a stapler, and a paper slicer or scissors. Valentine's Day confetti, a full set of markers, colored pencils, balloons, heart di-cuts, and stickers will make this even more exciting and eye-catching for the students. templates of what students should write on each Blind Date book. They will need to write the book's barcode and other minor hints about the book. I've found that giving a few hints about the book helps keep the immediate returns to a minimum. It also helps those super-readers know if they have already read the book. templates for students to fill out after they try out their Book Blind Date. This isn't totally necessary, but I like it because it gives students a chance to reflect on their reading a bit. It also gives me an opportunity to assess the books I've selected as Blind Dates to make sure they are hitting the mark. I genuinely hope they love the book, but the reality is, they do not always love it. And that's okay, too. Printable, editable book information templates in eight designs. These go on the outside of the book blind date. They are designed to give students small hints about what kind of book is inside. prizes, if you want to give them. I like doing daily drawings from the entries. Weekly drawings work, too, if you are in a smaller school and don't have loads of entries each day. I do Valentine-themed candy for daily drawings and book fair gift cards (with other small items) for the grand prize drawing. Our book fair is in March. Please do not try to keep up with this all by yourself. 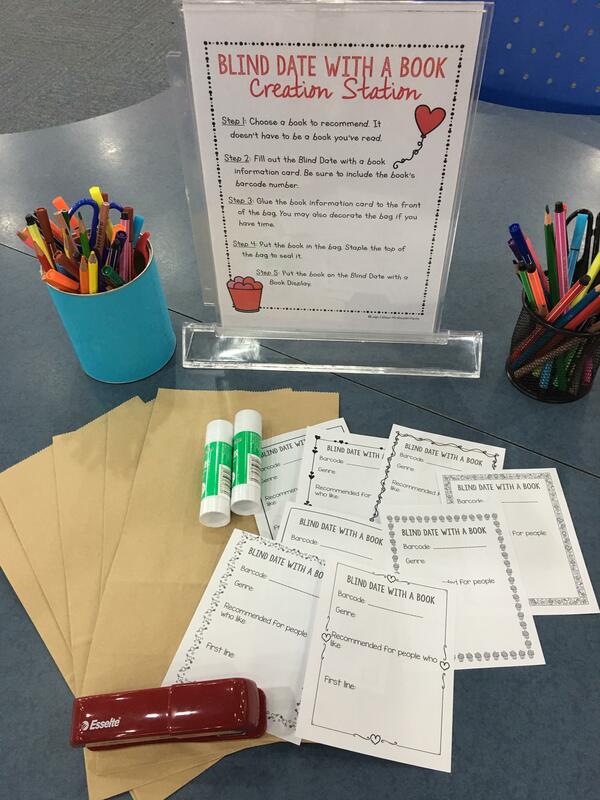 The students will check out the Blind Dates faster than you can create them, and you will run yourself ragged if you are the only one putting them together. Invite your teachers and students to help you! They LOVE creating Book Blind Dates, and it takes so much pressure off you. Sure, you should also make some, but you shouldn't get to have all the fun! And it's great if different grade levels are creating them because you'll get the most variety that way. I had a group of sixth graders creating Blind Dates today, and after checking out all my Blind Dates, they filled the whole table back up in about 30 minutes! Thanks, guys! Put the supplies listed above and some simple directions on an empty table. Do your best to ensure the table is centrally-located and will be noticed all day long. My experience has been that if I leave the supplies out, students will come. Again, I'm going to endorse using paper lunch sacks! This is the first year I've used them, and I will never go back to the Scholastic catalogs we used to wrap them in. 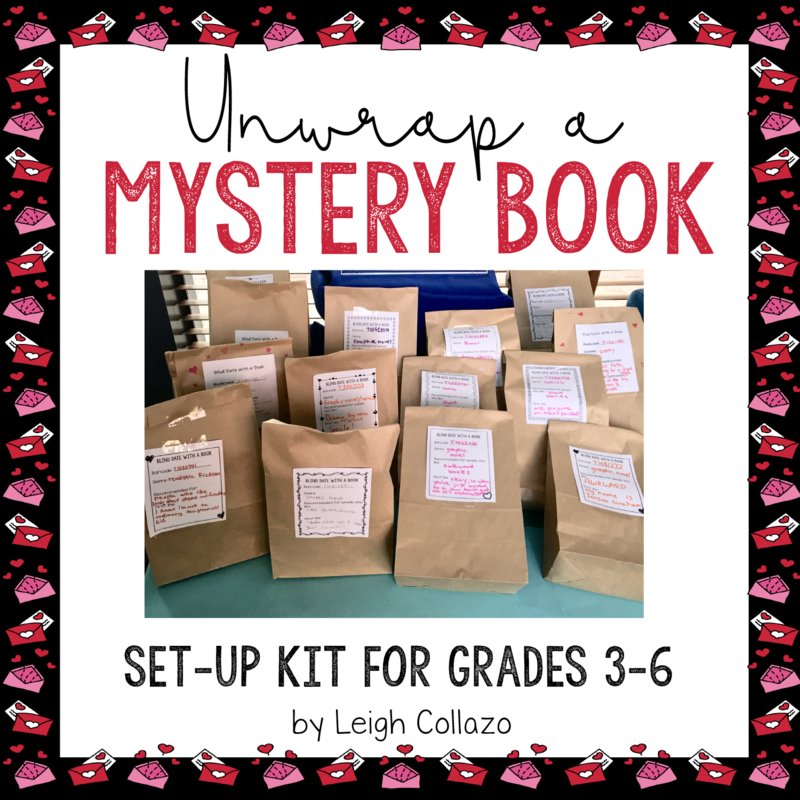 Even your very youngest students are capable of putting a book inside a bag. It's truly so. much. easier. It's probably cheaper, too, and there is far less mess. No more tiny scraps of wrapping paper all over the floor! 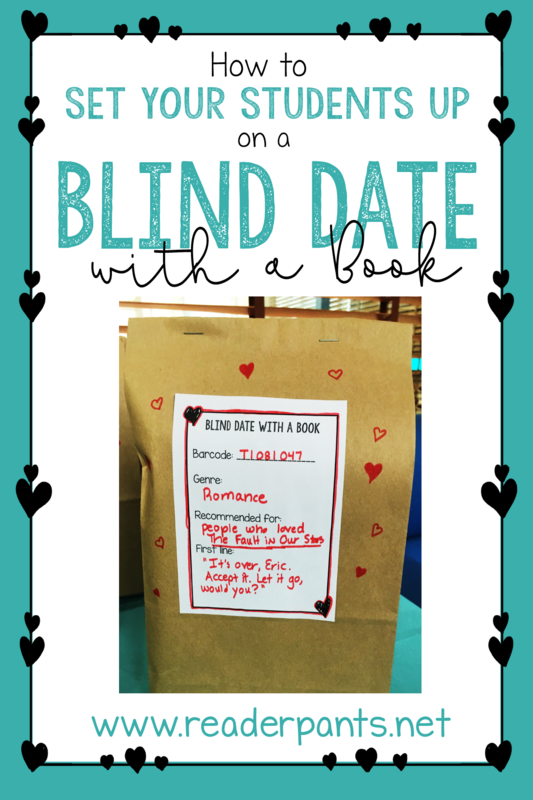 Where will you put the Book Blind Dates? How will students know what they are and how to check them out? Your book display should be eye-catching and impossible to miss. Balloons, confetti, colored cloths or paper, and di-cuts are surefire ways to get your students' attention! Your display will also need some kind of instructions on how to check out the books. No matter how much you talk it up, there will be students who don't know what the mystery bags are and won't ask. Plus, the sign is a great way to advertise your program with teachers, parents, and administrators who might come into the library. I just put up my display two days ago, and I've gotten several compliments on it from other teachers. The English teachers know what I'm doing because I see their classes regularly, but the science and math teachers usually don't. As soon as you start putting out mystery bags, people will be curious about them. 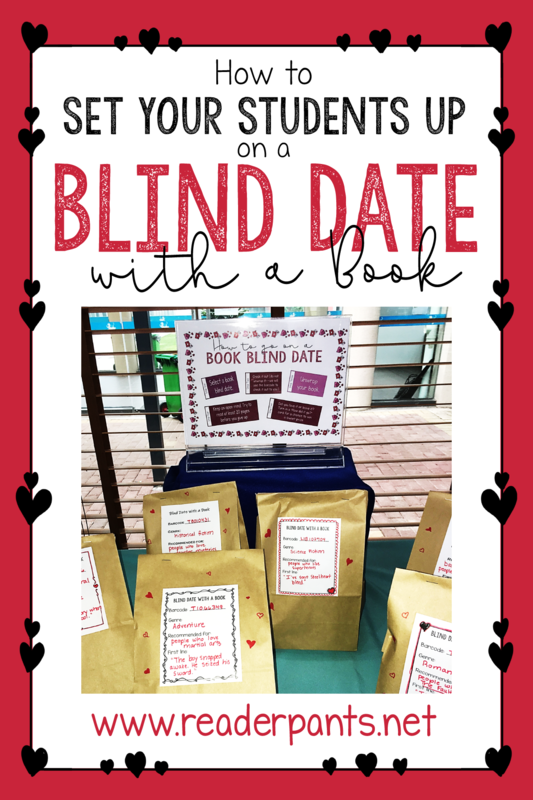 Promote your Blind Date with a Book in your school announcements, library newsletter, and via email (especially for teachers). I also include a bit about Blind Date with a Book starting in the second week in January. You don't have to set all this up in one day. Last Friday, I set up the display with everything except the books. Monday, the display sat empty because my paper lunch sacks had not arrived yet. I filled out a few book information cards (what goes on the outside of the bag) so I was ready for when the bags arrived. The bags arrived Tuesday, and I had already pulled six books and filled out the information cards. All I needed to do was glue the information card on the outside of the bag, put in the book, and staple the top. Easy-peasy! 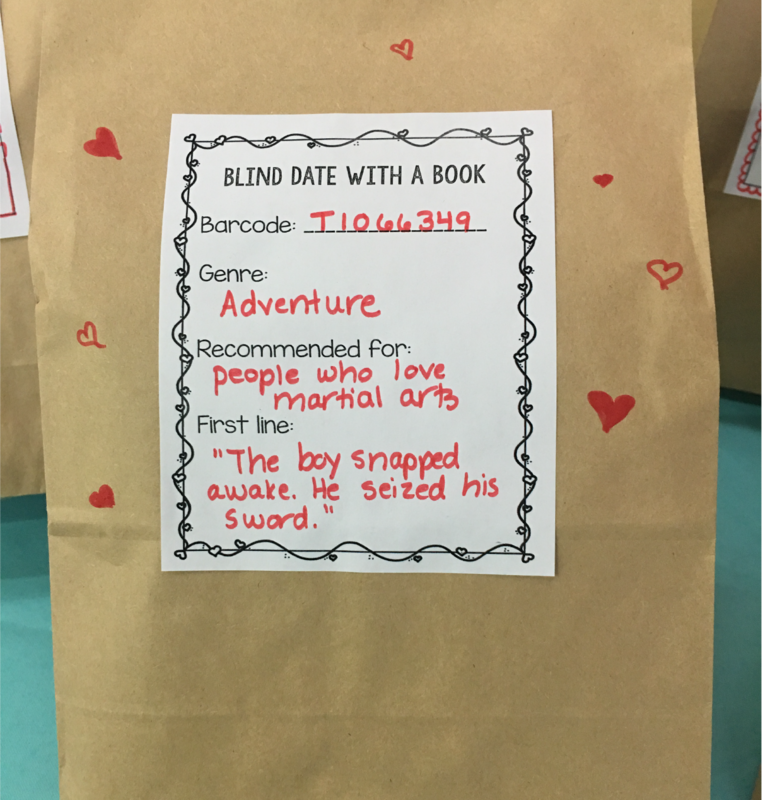 By Wednesday, all of the original six Book Blind Dates I had created had been checked out and replaced by books from that sixth grade class. I worked on some more after school (to add some YA titles), and the display is now very full and ready to go for Thursday morning. 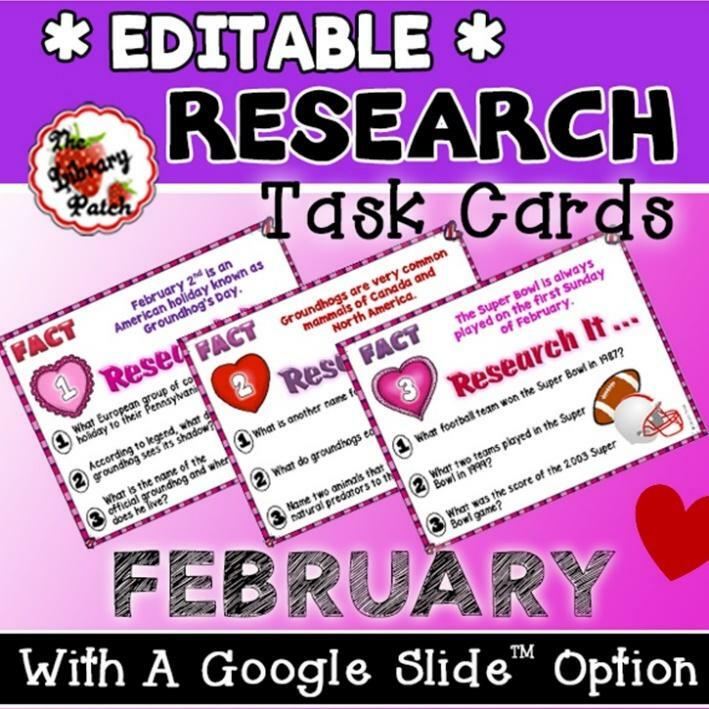 Next step in the Hop...The Library Patch, which features a center with February task cards to help your students master research while learning interesting facts! Let's start a conversation! All commenting on Mrs. ReaderPants is moderated and CAPTCHA-free! Please submit your comment only once--it will appear shortly. I love blogging and sharing ideas and materials with librarians and teachers all over the world. But as much as I love blogging, I do have expenses related to growing this blog and making it a useful tool for other educators. As such, some posts contain Amazon Affiliate links. Every purchase you make (even if it isn't a book I recommended, or even a book at all) helps me continue to create and share high-quality, useful materials for librarians and teachers all over the world.